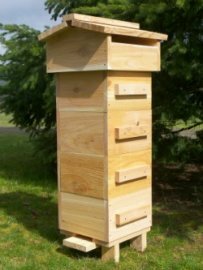 Whether you want to attract and improve the health of visiting honeybees, or you have your own healthy alternative honeybee hive(s) to tend, here's an often overlooked enhancement to overall honeybee care. When people think of natural honeybee health, they sometimes forget about providing water. Even commercial apiaries using conventional honeybee care have left this important element out. Honeybees drink water and also use it to regulate the temperature of their hives. If there is no water nearby, they may travel further than you want them to in search of it, eventually seeking a preferred home closer to water, or even upsetting the neighbors with a swimming pool. "A saucer of water (which is continually refilled), maybe eight or ten inches in diameter, filled with stones can be of great assistance to the bees," Ron said. "Moving, filtered water is even better. A small pump splashing, recirculated and maybe filtered water over a flat stone of some size is another option. Make a little water feature. "In the final analysis, the bees ultimately decide where they want to go for water, so it's good to do an inexpensive experiment at a location or two (always in the sun) and if they become interested in tanking up there, you could then substitute something more elaborate if you so desire. "The big issue is avoiding the possibility of the bees being blown by wind gusts into water with nothing available for them to climb onto. Once they start taking water, you must not let it go dry or they will go elsewhere. You will be amazed at how quickly they can empty a saucer on a hot day in late spring. "You have to put your water source out early in the season because once they start taking water somewhere, oftentimes they are disinclined to change." Some people are experimenting by giving bees the option of water with a touch of quality sea salt or organic apple cider vinegar as an addition to their other natural honeybee care. Here are Ron's thoughts: "Good, pure well or spring water obtained locally is usually best. Some beekeepers have tried various homeopathic remedies and other things to help the current stressful situation. Flow Form cascades (Google this) are of interest to others. "Neighbors' swimming pools are frequently places they may go to. This fact may cause issues with nearby families. You might want to avoid this if possible since bees taking water on wet cement walkways with children running around can upset parents." If interested in adding various minerals or other additions to pure water for the bees, one option is to make sure the bees have a choice and can choose according to their needs at the time. Place several containers close together and give the honeybees a choice (such as one with plain water, one with a pinch of sea salt, and one with a few drops of cider vinegar) and observe the results. 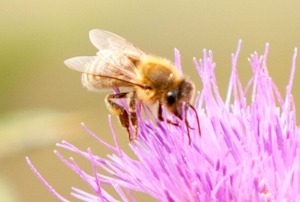 The bees themselves are often the real experts of their own honeybee care. Also, if your honeybees still seem to ignore your water supply for a more distant one, try a larger surface area of water if possible, which may make it easier for them to detect it as a source.